Need some Christmas gift ideas? 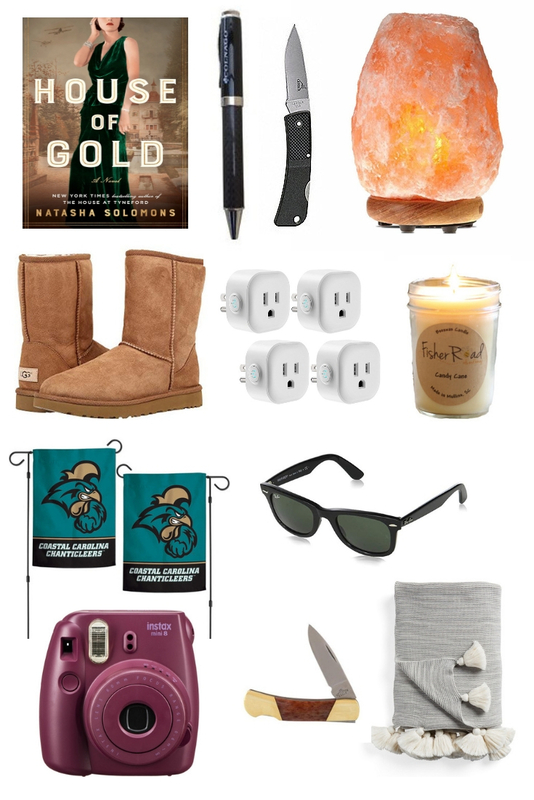 A few of our friends gave us some suggestions so we decided to make a gift guide! House of Gold by Natasha Solomons : Vickie at Litchfield Books recommends this as one of the best of the year…and she has several autographed copies in stock. Terrific book. Colorado Pen / Gerber Pocket Knife : TOM VITT….from HTC’s “Ask Tom”says…. I’m a big fan of nice pens and pocket knives. You carry them with you, use them every day and could conceivably hand them down to a son or daughter. Another idea, I am a believer that a nice bathrobe is the most underrated piece of apparel in a man’s closet. Another thing I use every day. I have one from a resort in Florida that’s 10+ years old. It has seen better days, but I’m not giving it up until I get a new one. Himalayan Salt Balls : Ron Zwing is an artist and marketing guru, says these Himalayan salt balls may be the best gift he has ever received. Fisher Road All Natural Beeswax Candle : Beth Hill from Annabele’s Attic in Calabash recommends these locally made beeswax candles made right here in South Carolina. Coastal Carolina University Garden Flag : Trenny Neff from Coastal Carolina University wants you to show your Chanticleer pride with this Coastal Carolina Garden Flag! Cozy Knit Blanket : Sarah the Intern here at WEZV loves a cozy knit blanket. You can never have too many! Vionic Slippers : Lindsey Fisher, Marketing Director at Coastal Podiatry recommends these Vionic orthopedic slippers to keep your feet warm around the house this winter. Coastal Podiatry sells them at both their Carolina Forest and Little River offices. Jamie Croland of Edward Jones says surprising someone by sending a tailor to their home or business to be fitted with a custom shirt is a wonderful gift idea! Heather Kidder from Ian Maguire Law Firm of Myrtle Beach loves a gift with purpose. She recommends making a donation to a charitable organization like Save the Children, Operation Smile or her own organization, Penelope’s Playhouse. With every purchase from their website, 5-20% of the proceeds are donated to the Grand Strand Humane Society. Penelope’s Playhouse shop is linked here. Melinda Chappell of NMB Aquatic & Fitness Center says she loves Jan Karon books! DESKTOP RADAR – So many people ask about the best radar to get for their computer. Both of these are just like having a TV station’s radar system at your home.